The room in 1868. Lithograph for Jos. Shannon's Manual by W. C. Rogers & Co. 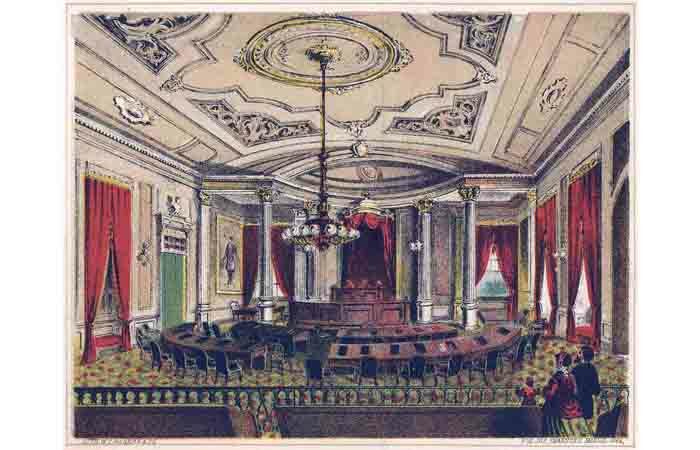 The Board of Estimate chamber as it looked in 1868. As the city works through the processes of once again revising its Charter, perhaps with two concurrent initiatives – one by the mayor and one by the City Council – there are lessons that should be learned from past efforts, particularly the Charter Revision of 1989. Before the 1989 Charter change, politics in New York was much different. There was a Board of Estimate, made up of the mayor, the comptroller, the president of the City Council, and the five borough presidents. All land-use actions, budgets and contracts as well as other civic actions had to be approved by the full Board of Estimate. The mayor was the city’s chief executive, but he had much less power than might be assumed. Each of the borough presidents had one vote, and each of the other members of the Board had two votes. For any action impacting our neighborhoods and work, there were many points of entry for advocacy. You could reach out to your borough president, and these members often voted as a block. With the borough presidents and one other citywide official, mayoral proposals could be defeated. And by getting just one member of the Board on your side, it was almost always possible to at least get an item adjourned for a month, allowing additional time to organize and lobby around an issue. And yes, there was a New York City Council—but this body was not taken very seriously, often derided as the governmental entity responsible for street naming. That all ended with a lawsuit claiming that the city’s governance process violated the equal protection provisions of the U.S. Constitution. This lawsuit (Morris v. Board of Estimate) was commenced in 1982 by three registered voters in Brooklyn who sought declaratory and injunctive relief to correct the disproportionate voting scheme of the Board of Estimate where Staten Island, with about one-tenth of the population, had as much voting power as Brooklyn. The federal District Court ruled in favor of the petitioners in 1986, a decision that was later confirmed by the U.S. Court of Appeals and ultimately by the Supreme Court. In 1989, Mayor Ed Koch appointed a new Charter Revision Commission, with Frederick A. O. Schwartz as its Chairman. One response to the court rulings could have been simply to institute proportional voting at the Board of Estimate. But that would have left executive power diffuse, requiring those with business before the city to navigate and satisfy numerous government officials possessing what amounted to shared executive decision-making authority. Ultimately, this commission would recommend the most dramatic changes in city government since the 1898 consolidation. The Board of Estimate was abolished. The City Council gained many of the former powers reserved for the Board. The comptroller was removed from non-financial decision-making. The independently elected position of president of the City Council was abolished, replaced by a speaker of the Council, chosen by his or her colleagues. A new office of Public Advocate was established, which effectively replaced one directly elected citywide official (Council President) with another. When Schwartz was asked why this position was created, his response was that there needed to be an office that could be used as a platform for future mayoral contenders. The new charter was passed by voters 55 percent to 45 percent, a solid victory for the mayor and his commission but certainly not an overwhelming one, which brings us to lessons learned. At the beginning of the public process ahead of the 1989 change, elected officials, advocates, local leaders (mostly from community boards, and union representatives formed a group called Citizens for Charter Change. The driving force behind this collaboration was then-Councilmember Ruth Messinger. As proposals were floated about different ways to comply with the court mandate, this group also deliberated on what a new charter should look like. Over time and after countless public meetings, the commission worked out a framework for the new charter. The ongoing work of the Citizens for Charter Change was a difficult task and there was certainly not unanimity within the group. But at the point when the commission was close to realizing a new framework for city governance and the coalition had to decide what positions to take, Messinger and a small group met with Schwartz. At the next collaborative meeting most of us who were not part of that meeting were surprised by the news that, in return for concessions made to some of our demands, “we” had come to terms with the commission and were now supporting the framework that the Commission was getting ready to push forward through a publicity campaign in preparation for the November vote. And what were these concessions? As I remember, there were three significant ones. Read our coverage of the 2010 charter revision process. The first had to do with Public Interest Corporations—those entities created by state law that had authority to develop projects without going through the established land-use review and approval processes outlined in the charter. Under the new charter, these entities would be required to go through local review processes. The second concession had to do with local planning – namely, 197-a plans. These planning prerogatives had been in place since the 1975 charter revision. Oddly enough, though, no such local plan (mostly, but not exclusively, the province of community boards) had up to that point been adopted, and it was no wonder why: Each time a local community board stated its desire to initiate such a plan, City Planning took the position that the Commission would not certify it without a full Environmental Impact Statement. These assessments could cost upwards of hundreds of thousands of dollars. The new concession from the Schwartz Commission was that it would be written into the charter that the cost for all such EISs would be absorbed by the city. The third big “win” was language inserted into the Charter authorizing every Community Board to hire a planner. Many of us were very upset by this agreement, but the outcome of whatever happened at that closed door meeting had the effect of splitting the progressive community in two. Most members of the Citizens for Charter change remained with the collaborative. Many of those worked to support the Schwartz Commission recommendations. Some just removed themselves from the conflict. Others of us spent the better part of the year leading up to the November vote opposing the proposal. We appeared on cable TV panels, spoke at community boards and civic leagues—traveling the city to garner support for the initiative’s defeat. In November of 1989 Charter Revision passed, and this city elected its first black mayor, David Dinkins. And what became of the “victories” secured by the Citizens for Charter Change? Almost immediately upon taking office, the city’s new Corporation Counsel, Victor Kovner, took the position that the City Charter provision reigning in Public Interest Corporations was invalid based on state preemption. When community boards went to City Planning to discuss plans and the city’s process for funding the Environmental Impact Statements, the city’s long held position changed. Where formerly there was the need to do an EIS due to a plan’s potential impact, the city now took a different position: They reasoned that because such local plans were really aspirational and advisory and really had no impact, there was no need for an EIS. And as for planners? When community boards inquired about that, they were told that they always had the authority to hire planners and could proceed to hire them within the constraints of their current budgets. As we endeavor again on the path of Charter Revision, and advocates decide how much time and effort to put into the effort, we have to learn from the past and be cognizant of what we are up against. “Good government,” assuming that such a thing is possible, will not come about through public processes that sound good but do not alter the structure of power relations in this city. Real change only comes through the devolution of more decision-making power to the local level combined with accountable local decision-making bodies and elected officials. What passes now for decentralized government and localized democracy is little more than window-dressing that gives the illusion of real participation while concealing from view arrangements that ultimately govern this city and end up undermining democracy. Harry DeRienzo is president of the Banana Kelly Community Improvement Association. Excellent piece. I would say most people engaged with land use issues today are focused on the sham of public hearings. The only two real opportunities for the public to speak is in front of community boards and borough presidents–both of which play only advisory roles. City Council committee hearings often only have the Chair present–as experienced recently on a proposed rezoning in Brooklyn for 142-150 S. Portland Avenue. Local residents end up feeling that the fix is in, the game rigged to favor developers. The EIS requirement is similarly merely an expensive bit of phony analysis, since most of them are done by a handful of firms hired by the developer, and the conclusions distort real impacts by manipulating data or a shrug that minimizes real effects like shadows. Lawsuits brought on the basis of EIS flaws never win because judges don’t want to thwart government. The stranglehold of REBNY and potential developer profits has replaced real public policy debates regarding affordable housing and land use planning. Solutions? A long, multifaceted public-engagement process produced a planning framework with many positives and few surprises for neighborhood advocates. But two areas of concern remain.